When I first saw this image, it reminded me of those semi-artistic photos framed in bold black frames and white mattes, that decorate wannabe boutique hotels. Or perhaps at the contemporary styled budget hotels like the Hampton Inn chain. A step up from those hideous faux-oil paintings that hang in budget motels. That said, I kind of like it. I like the proportioning, the cloud formation and the mix of architecture rendered in textured shades of gray. It’s also a simple image, which is bold enough not to be ambiguous. And while its fairly easy to make these kind of shots now, with some experience and the instant “character filled” black and white mode on the Olympus PEN-F, it’s something that I would have struggled with not too long ago. It’s a quiet image. The anti-HDR. Something in stark contrast with what I first started, seven years ago. I haven’t given up on HDR and bright saturated colors. Rather, I’ve incorporated these monochromes as an exploration of something different. 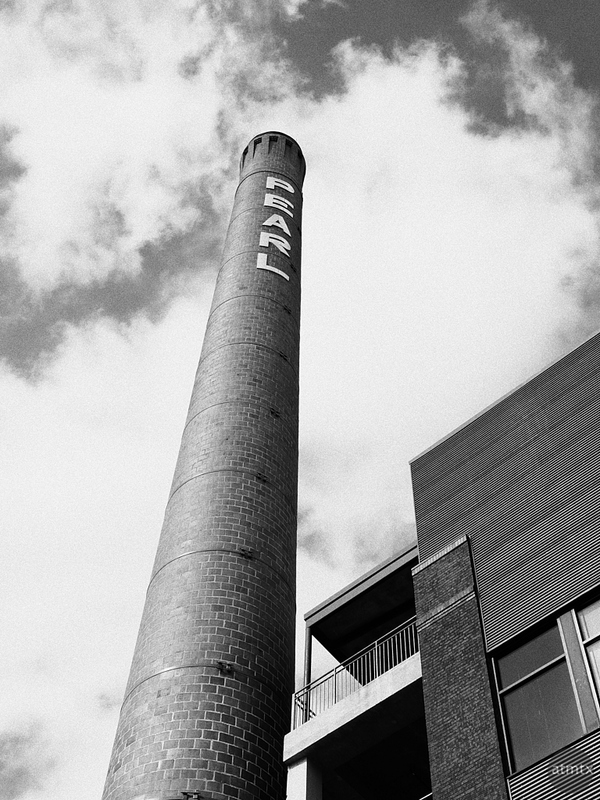 I shot this at the renovated Pearl Brewery which is fairly close to Trinity University. A short drive away though not within convenient walking distance. I guess that’s OK, since places with $4 lattes should not be where college students hang out. They need to be satisfied with more modest, budget conscious establishments. On the other hand, this texture rich place is fantastic for detail loving photographers. Thanks for you comment, Laurent. Not sure. Or at least not on a regular basis.